Due to limited living space and my quest for additional larger tanks, i embarked on a project to customize a 2-tier metal stand & tanks setup. I've spoken to other fellow enthusiasts who have also been keen on similar setups, so i've decided to post my progress to share the experience. I wanted a metal stand which could hold and sustain the weight of 2 x 64 litre/60cm tanks (L60cm x D30cm x H36cm) positioned in a double tier layout, so i got a stand custom made to my specifications. The height of the stand was to be 90cm tall. 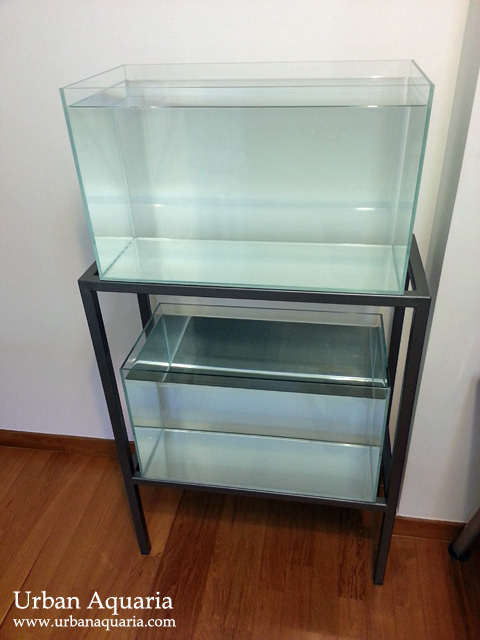 With the 36cm height of my intended tank on top, the total height of the setup will be 126cm. I've found that this is the ideal overall height for me to view the top tank while seated at my desk (the tank will be at eye level), and it'll still be easy for me to scape and maintain the tank too. The middle section of the rack has a height of 56cm, with the 2nd tank there also at 36cm height, this allows for a 20cm working gap. From prior experience, this is sufficient enough for me to access the tank for setup and maintenance. The bottom section of the tank has a height of 30cm from the floor, this allows me to place 2 x compact-sized canister filters underneath (along with the power plugs), so that they are somewhat hidden and less noticeable (compared to placing them beside the stand). In addition, the stand was customized 5cm wider on each side, so that there is some extra clearance space on the left and right side of the both tanks. Here is the completed customized metal stand. The build quality was good and it was made to my specifications, unfortunately the metal stand maker could only paint it black... but i preferred a different color. So i proceeded to spray paint the stand myself. I tried silver (too bright)... grey (too plain)... then i eventually found a dark metallic grey color that fit the tone i was looking for perfectly. After hours of sanding, preparation and carefully spray painting multiple coats, this was the result. 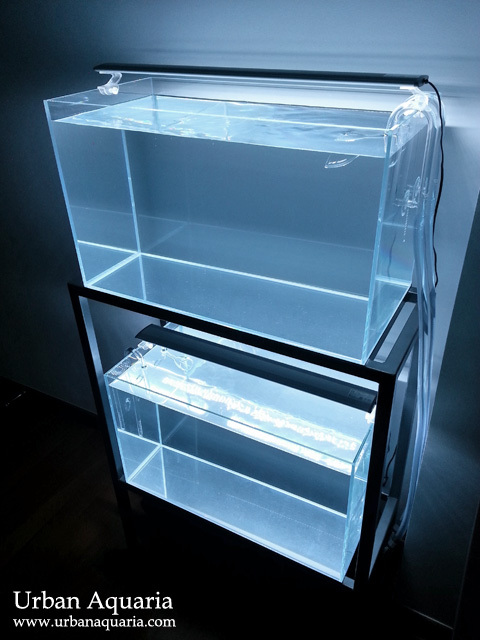 I prefer high clarity tanks, so my choice of tanks are made of low-iron glass with minimal silicone. 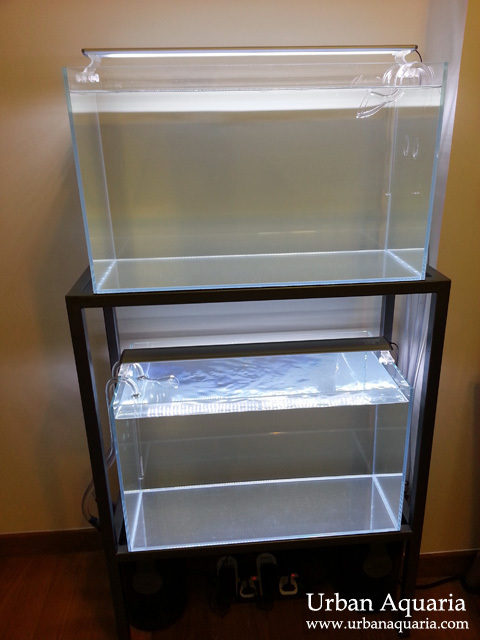 I choose the popular tank dimensions of L60cm x D30cm x H36cm. 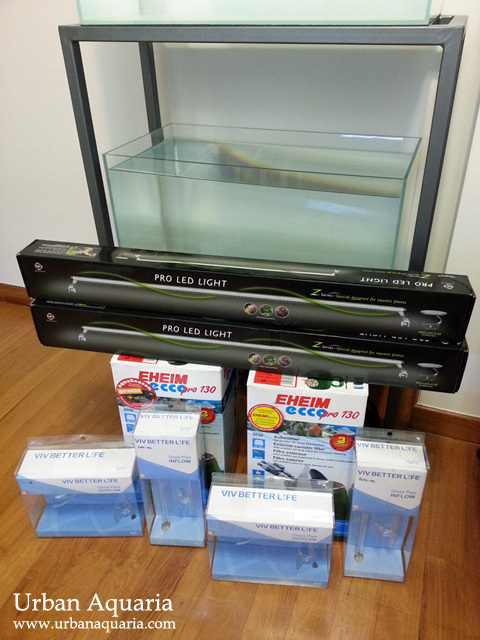 For flow and filtration, i'm using Eheim Ecco Pro 130 canister filters, along with VIV glass lily pipe sets. For lighting, i'm using Up Aqua Z-Series Pro LED Z-20 (60cm) light sets. Here are the canister filters and power plugs positioned at the bottom section of the stand. Everything is kept within the footprint of the stand, so that it is neat and tidy. This still allows for full access to the filters, double taps and hoses, which makes regular maintenance much easier. Once all the items are assembled and plugged in, this is what the completed setup looks like with the room lights on. Here is what it looks like with the room lights off. Another angle, this is the view from my desk. Overall, i'm quite pleased with the setup. Hi, your aquascapes always look insiring & lovely! Honestly you seem really organized & neat in your aquascaping & planning. thumbs up! btw may I ask what tanks are you using? they look awesome! 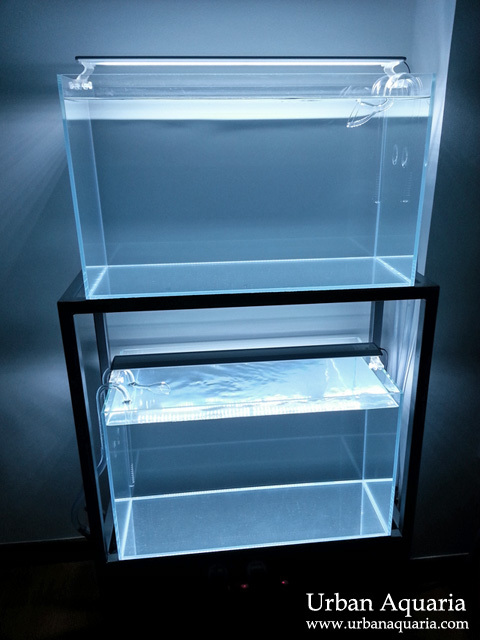 The tanks i'm using are made of low-iron glass, this allows for much higher clarity than normal tanks. Sometimes they are also referred to as opti-clear or opti-white tanks. You'll notice the glass is clear, rather than a greenish tint. Hi,bro. May I know where you get these tanks and whats the price around ? tks. 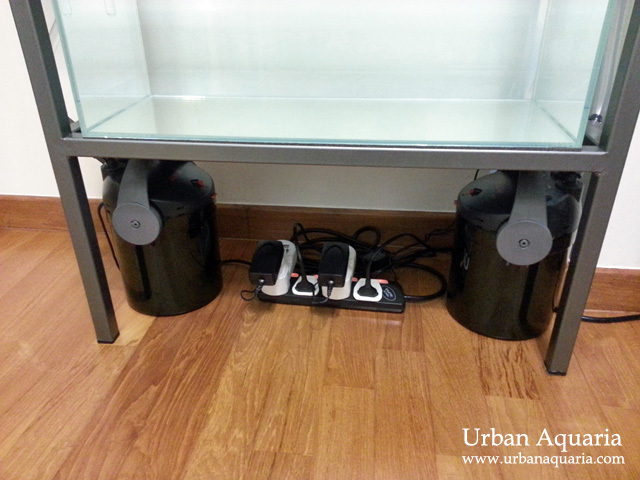 I got my high clarity low-iron glass tanks from Green Chapter at SGD$135 each. 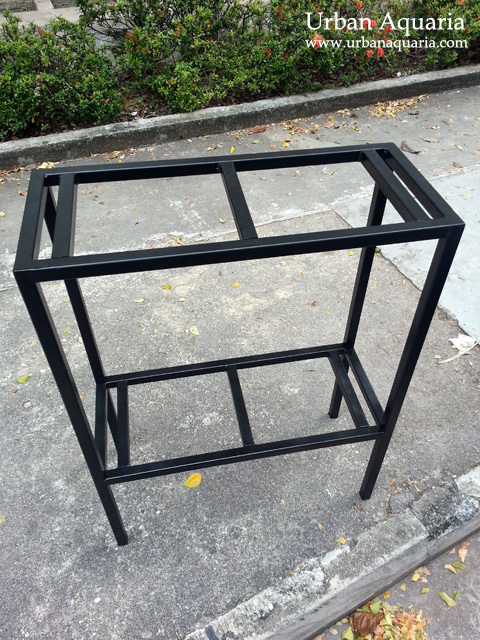 Hi, may I know where you custom made the metal stand and how much it costs? 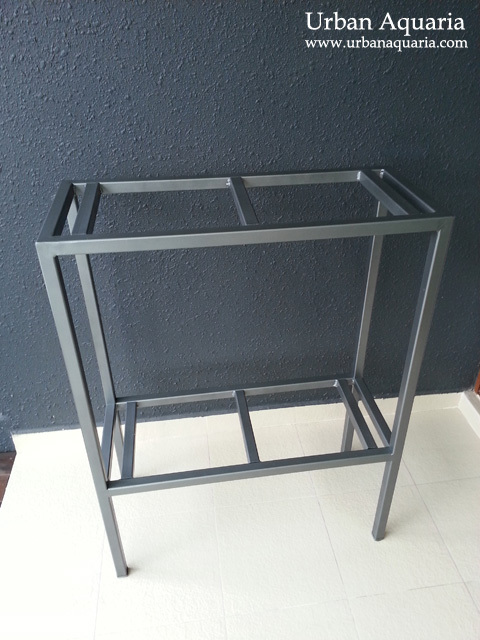 I got my stand custom made through East Ocean, it cost around SGD$70.